Even “small” disaster events can be dangerous -- people often think of earthquakes, floods and tsunamis when they think of natural disasters, but last year alone, severe thunderstorms caused 98 deaths in the United States, and winter storms and cold killed 115 -- twice the number of people killed by earthquakes. In a disaster scenario, keeping your beloved pets alive and safe can be just as important as looking after your family. Pets can’t plan for disasters or know what to do in case of emergency -- but humans can. No one knows for certain when a natural disaster will strike. But being prepared and having a disaster plan can help keep you, and your pets, out of harm’s way. 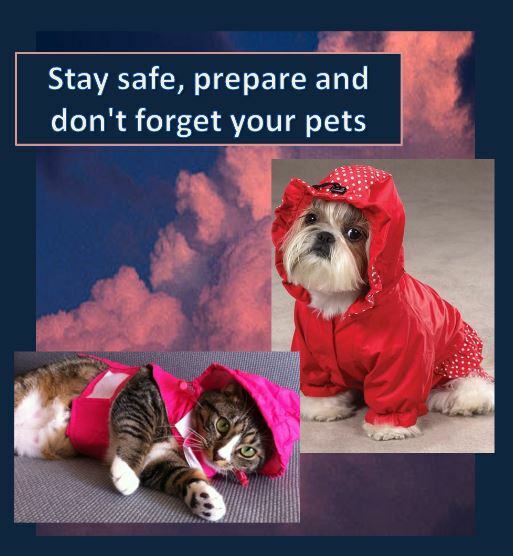 The best way to deal with a disaster is to be prepared, both for your sake and your pet’s. The first step you should take in preparing for a disaster is to know what kinds of disasters are likely in your area. Is your house on a flood plain? Do you live in an area prone to earthquakes or forest fires? Knowing what could happen is the best way to prepare for what might happen. The next step is to find out what resources are available in your area. Many cities and towns have pet shelters or assistance programs that can help look after your pet in case of emergency or disaster. For example, not all Red Cross shelters take pets, and not all animal shelters have emergency facilities. Don’t make assumptions -- consult your local veterinarian or animal shelter and find out what resources are available. You can most likely set up an appointment with the vet to find out what you can do to plan for disasters. Make sure your pet has an identification collar with the most relevant contact information, or microchip your pet so they can be found. Purchase a pet carrier with your pet’s name and your contact information on it. Make sure your pet is familiar with the carrier, so you don’t struggle with getting them into it should disaster strike. Make a list of local motels, boarding facilities, and phone numbers of people who could take care of your pet in case of emergency. Consider making a pre-made handout for your pet, with a photo, contact details, and other vital information, in case you get separated. Consider placing stickers around your home that will notify emergency and rescue personnel that there is a pet on the premises. Keep muzzles, leashes, or restraints somewhere where rescue personnel can easily find them. You should also have a readiness kit in case of disaster, not only for yourself, but for your pet as well. Food, water, blankets, flashlights, emergency cash, disinfectant and first aid kits are a must for both kits. A pet’s emergency kit may also include feeding dishes, litter trays, collars, cage liners, and toys. Food and medication should be rotated out of the kit when necessary, to ensure you don’t go into a disaster with expired necessities. Now that you’re prepared for the possibility of disaster, your next step is knowing what to do should disaster actually happen. How you should respond will depend on what kind of emergency is at hand: will you shelter in place, or evacuate your home? If you are sheltering in place, there are some steps you can take to help make sure your pet is safe. Find a safe room with few or no outside windows for you and your pet to take shelter in. Get rid of any hazards, and if possible, close off any small areas where pets could try to hide and get stuck. Remember, in a disaster scenario, your pet will be afraid too, and will need your help! If your disaster scenario requires you to evacuate, take your pet with you if possible. Some pet owners believe their pets can “fend for themselves” in a disaster scenario. This is rarely the case. Not all pets will survive for long on their own, and may get lost permanently. If you must evacuate your home temporarily and leave your pet behind, confine them to a small room with plenty of food and water, to reduce the possibility of harm. Make sure you know your evacuation route. If there are emergency shelters in your area, find out if they take pets -- many will not, unless they are service animals. If the emergency shelter will not take animals, you may have other options, such as friends or neighbors. Find out if there are animal shelters or pet-friendly hotels somewhere along your evacuation route -- sites such as the Humane Society can help with this. Lost pets can be one of the most heartbreaking aspects of a natural disaster. During Hurricane Katrina, over 6,000 pets in the area were lost. In many such cases, organizations such as FEMA, HSUS, and petfinder.com work to reunite pets with lost owners. If you get separated from your pet while in an emergency shelter, contact the shelter personnel -- if you have made a handout with your pet’s details, give it to whomever handles the pets at the shelter. Social media has also proven effective in finding lost pets and service animals -- pet owners can post to Facebook groups or pages and spread the word to thousands of others about their missing pets. Some pet owners take to writing blog posts or posting on Twitter with photos of their lost pets. If you are separated from your pet during an emergency and have microchipped your pet, contact the microchip company so you can get started finding your pet again. If your pet doesn’t have a microchip, the best course of action may be to contact animal control. Last but not least, be understanding and patient with your pet in the wake of a disaster. Your pet may take days or weeks to recover from the stress and trauma of surviving a natural disaster -- just like a person. If you are able, consider donating to your local animal control organization or Humane Society in times of disaster, to help other pet owners reunite with their loved ones. Preparing for disaster can be stressful and difficult to think about. However, being prepared can help prevent tragedy for both you and your pet. These printable resources and checklists can help you form an emergency plan to help keep your pet safe if and when the worst-case scenario happens.